We all know that when Columbus “discovered America” he was looking for route to Asia. His main drive was to find a short route to generate commerce with the Asian spices popular with Europeans. Columbus´ theory was right, the Earth is indeed round, and he could reach Asia by traveling West of Europe. However, he ran into a continent with many treasures. Many of these were spices that were not yet known to the Europeans. Chocolate and Vanilla are Both Native to Central America! Although Central America is a small region, it has provided some of the most popular tastes that we all enjoy to this date. If you want an example, just think of Chocolate! Could we live without it today? Hardly, it is sweet to taste and even makes us happy. Chocolate comes from Cacao, and Columbus himself took if back to Europe during his fourth and last voyage. Chocolate is native to Central America, and the earliest archaeological find proves that it was first enjoyed in Honduras! Other daily goodies native to Central America are the Cashew nuts. But few people are aware that vanilla is originally from Central America! Can you imagine life without vanilla? Heck, my favorite ice cream flavor is Vanilla! Ice cream would not be the same if there was no vanilla flavored ice cream! It turns out that vanilla is an orchid producing vine. Vanilla grows on soil, not in it. It needs a host tree to climb up on. Guess which is its favorite host tree? The answer is the Cacao tree. Is that unique or what? Chocolate and vanilla growing together? This is a magical relationship! 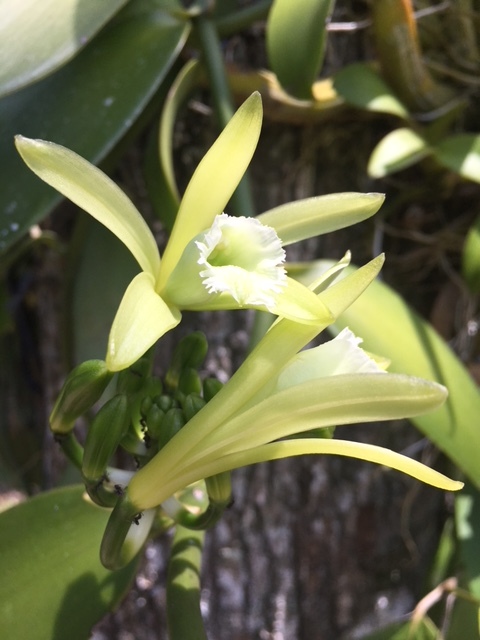 The vanilla orchid blooms a lovely flower. Less that 1% of vanilla blooms pollinate naturally. This means that it must be manually pollinated. This is one of the reasons why vanilla is so expensive! Even though Vanilla is native to Central America, there are few vanilla plantations in Central America today. Vanilla is primarily produced in Mexico and in Madagascar. There is no doubt in my mind that countries like Honduras and Nicaragua should consider producing vanilla. The climate they have along their Caribbean Coast is ideal to plant and harvest vanilla. A Garden Full of Surprises! A Vanilla vine is beginning to flower! Today I was walking through our garden at La Villa de Soledad along the Cangrejal River Valley. I could not help but notice that our vanilla vine is flowering! My nephew, Yani tried his gardening skills at pollinating it this morning. I am anxious to see the results. It would be awesome to our own homegrown vanilla! I may even need to buy myself an ice cream machine to make my very own vanilla ice cream! No doubt that living in the hot, humid rain forests of Central America can have its benefits! I will keep you posted on the results!